A comedian named Bill Engvall once told us that stupid people should wear a sign explaining that they suffered from such a malady, just for our convenience. His reasoning was that if they were wearing some indication of their affliction we would not rely on them to help us. I completely agreed with Mr. Engvall. It is very difficult to get productive answers from some people, who are not endowed with common sense. We all know this. I found this sign in a bathroom, and I had questions. Questions about why someone might feel a need to flush a toilet in a public place for an extended period of time, for instance. Did they think that holding down the handle for so long would mean that their deposit would move more quickly out of sight? I wonder what that said someone might do in said public facility when their attempts to dispose of the "evidence" come back to haunt them. Certainly it was not anyone's intent to deliberately flood the restroom, but accidents happen. Did they immediately run, to avoid getting their shoes wet? Or did they stand there, shocked beyond thought, while the water quickly swirled out of the bowl and around their feet? I think that such an event would warrant a trip back home to change shoes, at least. 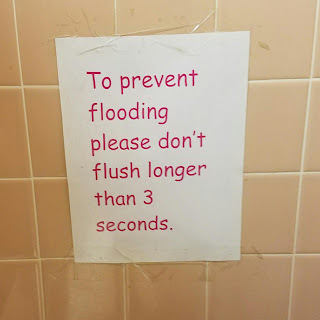 I also wonder how the sign makers arrived at the exact conclusion of three seconds. Did they break out the stop watch? I would have. Did they stand by with a mop, clipboard, and pencil, encouraging another person to "just hold down that handle for FIVE seconds now, okay? GO!!!" Did they draw straws, or do paper, rock, scissors, to determine who got to clean up after the experiment? Was a lawyer consulted on the wording of the sign, so as to avoid lawsuits? How would a lawyer bill for such advice? I think that he or she should have only billed for three seconds, but I'm sure the American Bar Association would disagree. The mind boggles, or at least mine does such boggling. Because you know that somewhere, someone, did cause this particular toilet to overflow by holding down the handle longer than necessary. Something happened, some squishy event occurred, necessitating the need for this sign. Whatever it was, I hope that it was as hilarious as I imagined it was. I was in a local business and went into the restroom. On the inside of each bathroom stall there was a sign that read "How to:FLUSH. 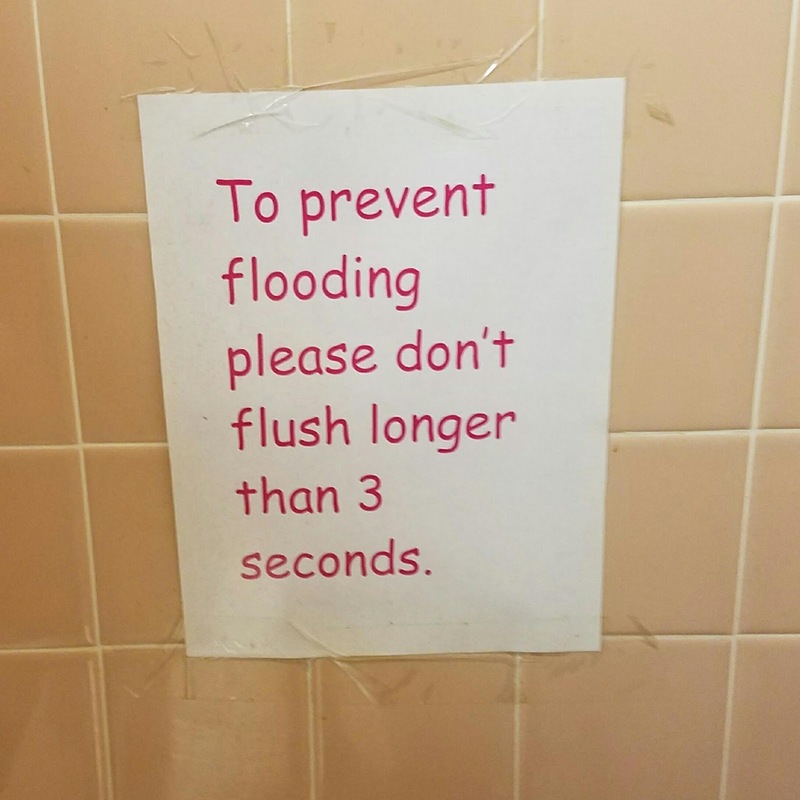 W e shouldn't have to make this sign , just take the time."